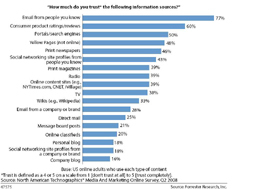 A recent Forrester Research study shows the breakdown of how much consumers trust different information sources. Search engines come in third place only behind email from friends and consumer reviews. This data is somewhat surprising since search engine results can be manipulated through Search Engine Optimization efforts, which sometimes go as far as Google Bombs. However, this research is also a great validation to the importance of internet marketing efforts and well designed websites. With people placing so much trust in search engines, it reaffirms the importance of Search Engine Optimization and being in front of potential clients. Knowing the importance of search engine results also demonstrates the importance of making sure your site looks like a trustworthy source. People looking for reliable information or vendors on a search engine will quickly discredit you if your web presence is lackluster and untrustworthy. It's important that the quality of your website compliments the quality of your online marketing strategy. 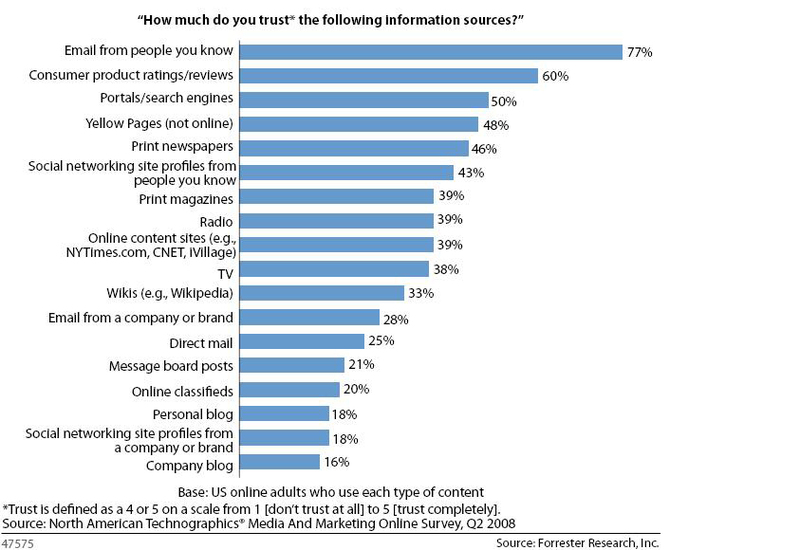 Another interesting tidbit from the report is that corporate blogs are the least trustworthy information source to consumers. This is a disappointing trend as blogs should be the most honest outlet for corporations to disseminate information and voice opinions. However,very public errors, such as the Wal-Mart blog fiasco, have caused consumers to be more hesitant when using company blogs as an information source. The report is very clear that this should not serve as evidence against blogging, but rather as encouragement to do it in an honest and engaging fashion. Another interesting aspect of the report is that consumers are more likely to trust email from a company rather than direct mail, supporting the value of email marketing vs. direct mail. Overall, new media fared very well in the report often times beating out its traditional media counterpart. It will be interesting to see how this trend adjusts over the next year as people become more savvy online and the space also becomes more crowded. By making sure to project yourself in a trustworthy manner online, through well designed sites and honest content, you have the opportunity to continue effectively influencing consumers in a cost effective manner through SEO and online marketing.